All of the Skin Republic's facial sheet masks are against animal testing so you can ensure that no animals have been harmed in the making of the products. 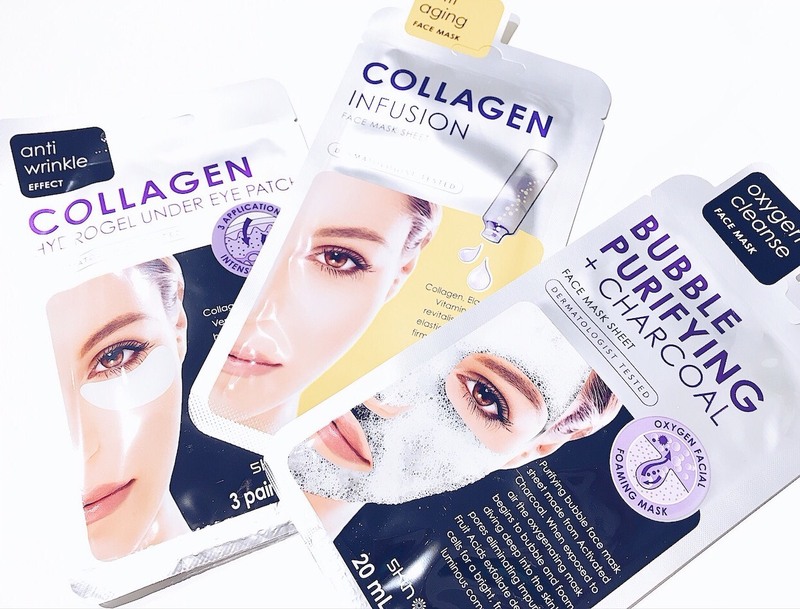 Sheet masks are made out of fibre or cotton masks - cut into the shape to fit your face, neck and décolletage - and have been soaked in liquid formula which benefit the skin in some way such as anti-ageing or for eliminating impurities. These are available at https://www.theskinrepublic.com.au/ if you're curious to learn more, otherwise you can find these stocked at your local Priceline store. (Priceline is usually my go to store for all the beauty essentials). Known as the oxygen cleanse face mask, this particular product has been a huge sell out for Skin Republic. 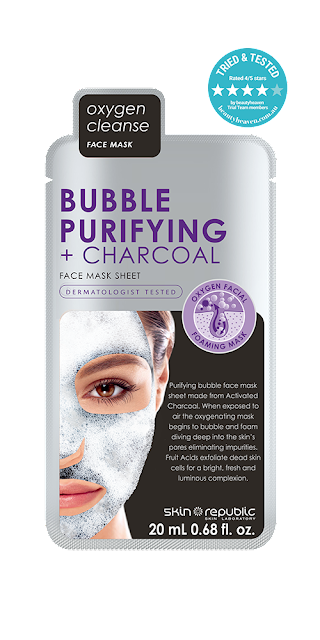 It's a purifying bubble mask where the face sheet has been made from Activated Charcoal. So once the face sheet is exposed to air, it begins to oxygenate and then it will start to bubble and foam. This will ensure that it will get right into your skin, eliminating any impurities from your pores. It also helps to exfoliate the dead skin cells on your surface revealing a smoother and fresher complexion which feels nice. 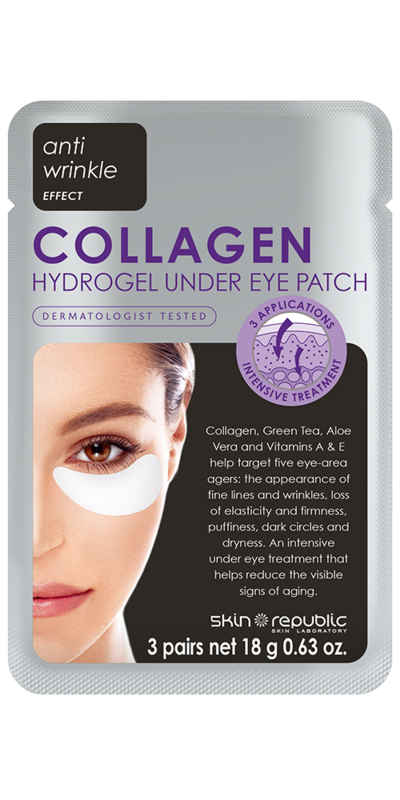 The eye patches contain Collagen, Green tea, Aloe vera and Vitamins A and E which help to target the eye areas being dark circles, puffiness, fine lines and wrinkles. Once applied to under the eyes, you get a cooling sensation which feels comfortable and nourishing. The eye patches also look to improve your skin's elasticity which is essential because it's the area around the eyes which age quicker than any part of your skin. I found these eye patches to be very hydrating and nourishing for the skin and I am really impressed with them. They definitely look to leave your skin looking much brighter and glowing as well. Last but not least, I tried out their anti-ageing face mask which has is infused with collagen being Marine collagen, Elastic, Vitamin E - which all combine to allow your skin to feel more rejuvenated and soft. Your skin will also look toned and firm as well as being more youthful looking once again. I find that this is a great mask to treat any fine lines, wrinkles, and any uneven skin tone. 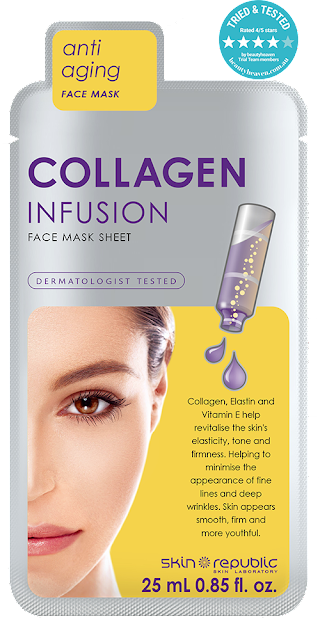 If you're wanting to look more youthful looking again, then make sure to pick up this Collagen Infusion mask. Let me know on what is your favourite mask from the Skin Republic range! Thank you Skin Republic for supporting me for this review. My reviews are based on my own experiences and I only recommend products that I truly believe in.